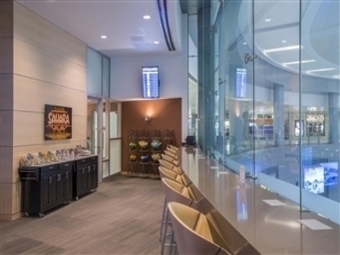 Airport Lounge Development Inc. (ALD), the global provider of premium, shared-use lounges and five-time Priority Pass Lounge of the Year Award winner, today announced a new replacement lounge in Terminal 1 at Las Vegas’ McCarran International Airport (LAS). 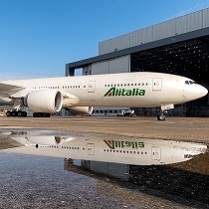 The lounge has seating for 149 people and offers an array of experiences for travellers flying for business or pleasure. This new lounge replaces the current Club lounge, also previously located in Terminal 1. Travellers can access the new lounge space from the concourse level between TUMI and Brooks Brothers, near gate 33. 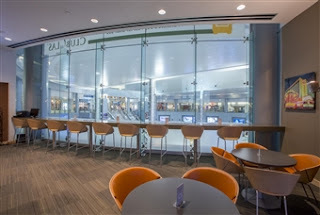 ALD operates a second lounge at LAS in Terminal 3 across from gate E2. Together the two lounges offer seating for 315 guests. A Productivity Zone serving as a dedicated space for business travellers. In addition to an abundance of electrical outlets, this workspace includes a desk-height counter, ergonomic task chairs, and access to a computer and printer. “Privacy” chairs are also available for travellers looking for a quiet space for a phone call or to read. A Relax Zone that features ultra-comfortable seating and ample electrical outlets, allowing guests the opportunity to socialize with fellow travellers or simply enjoy the sweeping views of the airport and Las Vegas. A Replenish Zone offers table and banquette seating for visitors to enjoy a selection of food and beverages from a hot and cold buffet and a variety of all-day snack items. A separate bar with dedicated seating allows guests to enjoy complimentary cocktails and premium spirits. The Club LAS’ bar offers guests artfully crafted cocktails and a variety of premium wines and beers. Travellers looking to enjoy non-alcoholic options can refresh at The Club’s “Hydration Station,” which offers thirst-quenching, healthful fruit- and herb-infused waters, including lemon pineapple cayenne, strawberry basil or lemon watermelon. The Club LAS gives back to the environment with a 100% plastic-less bar through the removal of all plastic drink stirrers and straws, replacing them with natural bamboo and compostable options. A Refresh Zone provides private restrooms and shower suites, offering spa-quality soaps and lotions to help travellers feel at home. The Club LAS is available to Priority Pass’ broad membership – including Lounge Pass and Lounge Key – which represents a vast number of credit cards, banks and other financial institutions. The lounge is also available to other LAS travellers through the purchase of a day pass. 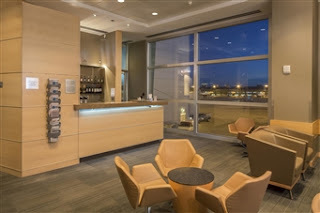 Airport travellers looking for a complete hospitality experience in a timeless contemporary environment can visit by purchasing a day pass online or at the lounge for a minimal cost of $40. The Club LAS also participates in the AAA Members Discount and Rewards Program. The lounge is open daily from 5:00 a.m. to 12:30 a.m. PT.